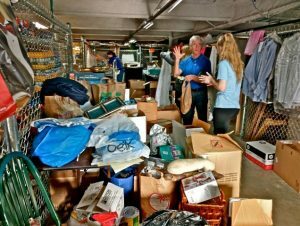 To help others that are in need through monthly collections of gently used clothing, furniture and household items which are distributed to parishioners and agencies in Charlotte, Union County and western North Carolina. Your donations are distributed to a number of agencies that serve the homeless, the working poor, and families affected by violence and abuse. Anything electrical, such as printers, computers, fax machines , etc. If you have items to donate that are not on our list of accepted items, please try calling the Habitat for Humanity Resell Store, Crisis Assistance Ministry, Catholic Charities and Monroe Outreach. Arrange a pick up, with advance notification of no later than noon the Thursday before collection day, by contacting Peggie Davis or 704-502-2205. 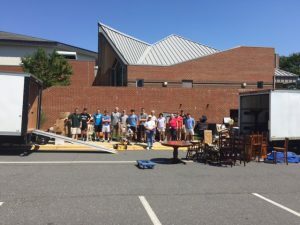 Items may be dropped off at the parish on the second Saturday of each month from 8 am to noon, at the ramp behind the Daily Mass Chapel (see picture below). 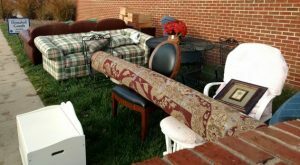 Items accepted: gently-used clothing, furniture, working appliances, household items and moving boxes. We are not able to accept mattresses and box springs, armoires, pianos, large TVs and drop-sided baby cribs. Pick up team: Pick up items from area homes. Need at least two people (usually men) per truck. Packing Team: Accept dropped off donations. Unload, sort donations, box items for shipment. Donated Goods warehouse is located under the Daily Mass Chapel. Access is from the rear of the church. Loading team: Load truck for delivery to western NC. High School teen volunteers are needed, but must preregister by contacting stmatthewdonatedgoods@gmail.com. We are always looking for people with trucks to assist! Generally, four hours, the second Saturday of each month. Volunteers also help with packing on Monday mornings after the 9 am Mass.